This is a WONDERFUL how-to drawing book. 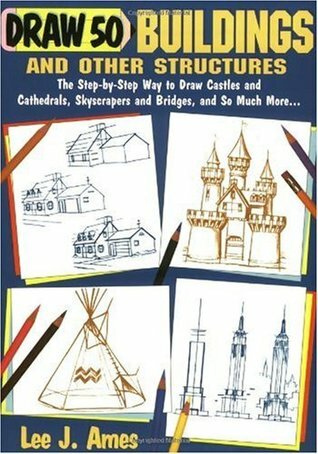 It gives easy-to-follow step-by-step instructions showing how to sketch buildings and other structures (tents, bridges, etc) from start to finish. GREAT BOOK for beginner/intermediate wanna-be artists! [This book was reviewed by Kimberly Weatherston, a volunteer with the Idaho Art Lab. ]I personally am not fond of 'How to Draw' books. I think they often prove to be frustrating, especially for budding artists, because of how so often the book takes you line by line through the drawing until ALMOST the end of the drawing...and then magically it changes from simple line drawing to fully shaded masterpiece. It was always that last step that frustrated me and had me crumpling my drawings into tiny little balls.The 'draw the rest of the picture' effect is not nearly as much a problem with this book.Architectural drawings are difficult, but this book does a very good job of going line by line to show you precisely how to go from the first step to the last one - no magic necessary. You can actually see how to go from the second-to-last step to the last one.Probably the only complaint I could have about the book is that in each step the 'new lines' are indicated with thick lines. Someone precisely following the steps might do too thick a line without realizing it, indicating the new lines with a different color might have worked better, but that is a small thing.The buildings you can choose from to draw are varied: from famous places like the Eiffel Tower or the Taj Mahal, to just examples of types of buildings like a pagoda or a barn. Not all the drawings are buildings, either - there are also things like the Golden Gate Bridge or a Japanese torii gate. I do not drawing landscape or scenery much myself, but if I needed to draw a building or structure for something, I would certainly be willing to turn to this book for guidance. Not bad to start with; has buildings and structures from all around the world, and not just the US. This book shows how-to, not by words, but by pictures. I loved it, and see how to use a method to get great results.